Home / Buying Guide / Which Adult Electric Scooter you Should Buy? Which Adult Electric Scooter you Should Buy? If you currently look the most popular electric adult scooters, there are two models that dominate the European market: The E-Twow S2 Booster and Egret One-GT . Both offer an impressive range of functions and both bring you in style from A to B. But what e-Scooter offers you more for your money? 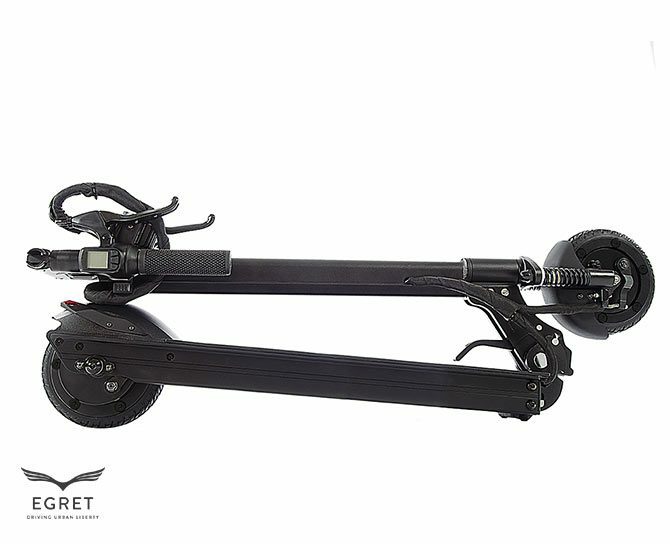 Walberg Urban Electrics’ EGRET provides high-quality, contemporary and effective answers to the individual needs of urban mobility. Walberg Urban Electrics is based in Hamburg, Germany. 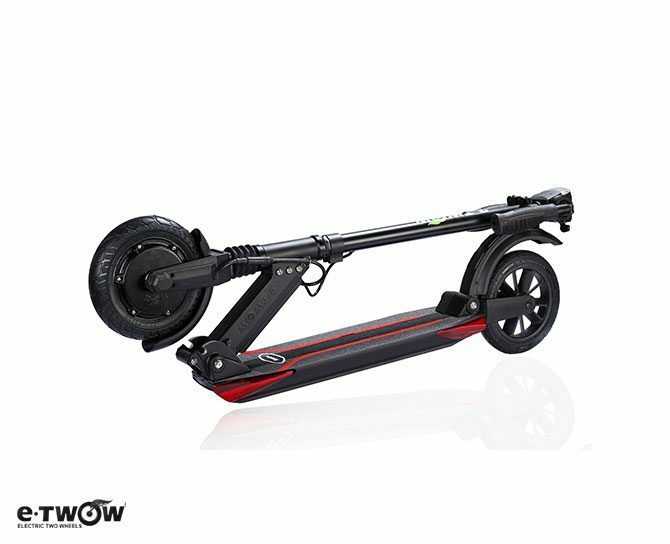 The E-TWOW – “Electric Two Wheels” brand is part of a large international concept, with headquarters both in China and Europe, focused on offering a new era of urban mobility, through their ingenious electric vehicles. A new era in Urban mobility. For big urban areas, it is important to have a scooter that can be easily folded up and carried when you get on the bus, the tube or train. In small, medium size cities could become a real alternative to public transport. 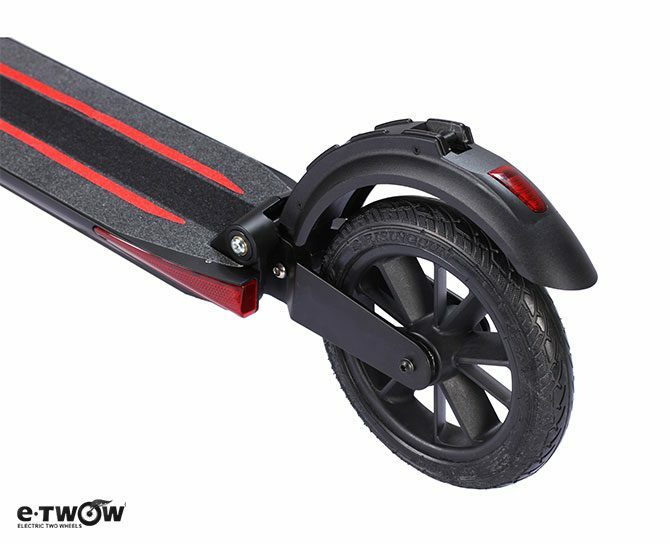 Although the E-Twow Booster and the Egret One GT can indeed be both folded very easily (and similar size), the E-Twow has a clear advantage when it comes to the weight: At 10.8 kg, the Booster Plus the lightest self-propelled electric scooters on the market. The One GT on the other hand weighs 13.5 kg. And while you do not notice the weight when driving, one perceives it quite clear when it is time to lift the scooter. Both brands have wheeled carrier bags in accesories for long distance transport. For the usual daily use both take you to destination (and back) without in between recharge. The booster will take you far up to 30 km before you have to recharge it. Compare this with the One GT, which has the range of 25 km, do not forget that this is the range under testing (no headwind, no gradients, minimum stopping and a driver weight of 70 kg). In the real world, we have 20-25 km from the booster (still more than enough) and acceptable 20 km from the One GT. The One GT is powered by a 36V 8Ah Li-Ion battery and a 250 watt motor. The booster derives its strength from its 33V 6.5Ah Li-Po battery, coupled with a powerful 500 watt motor. 36V 7.5Ah Booster S: The extra capacity gives you 5km more range, *30km in total. Max speed 33kph and the more voltage mean more torque. Perfect for riders over 80kg or hilly commuting journeys. *Real range in our test, 70kg rider. While both scooters offer similar performance, the booster has a great advantage when it comes to the charging time. The Boosters 3.5 Amp “fast charger” allows you to fully charge the battery in just 2 hours (the fastest time among all electric adult scooters). The One GT, on the other hand, takes 2 hours to reach 70% but it needs 6 hours until the battery is fully charged. The booster is equipped with two brakes, one recuperation front (KERS, the battery recharges every time you brake) and a manual friction brake rear (like a regular kick scooter, for additional braking force). The One GT has double drum brake front and back reduces the stopping distance dramatically. 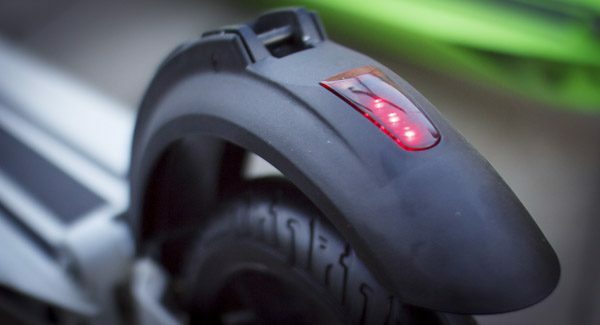 Both scooters have puncture-resistant, solid rubber wheels. However, we are dealing with a case where size really plays a role: With larger 200 mm wheels the Booster offers a much smoother ride than the One GT. The significantly smaller 160 mm wheels of One GT provide a much bumpy driving experience than the Booster (especially on asphalt and roads with cracks and holes). Both, however, are equipped with dual suspension, with shock absorbers on the front and rear wheels, which contribute to a softer ride. We are big fans of the design of the One GT with a sleek, modern look and it’s wider handlebar, the One GT looks awesome it also feels more robust when riding it. The design of the Booster PLUS is also top-notch. It’s thin footboard and the rear friction brake makes it appear as a conventional scooter for those looking for discretion. Both are solidly constructed from high quality aluminum. Where we have noticed that the handles on Booster become slightly wobbly while driving than in One GT, the Egret feels solid. The booster is available in four colors (white, black, green or gray), the One GT in black only. The spotlight is a bright LED lamp that illuminates your path you. And the rear lights are wired so that they light up every time you brake. He also has a Horn-button, which is integrated into the display (Note: the sound of the horn is a bit annoying and we do not use it too often). 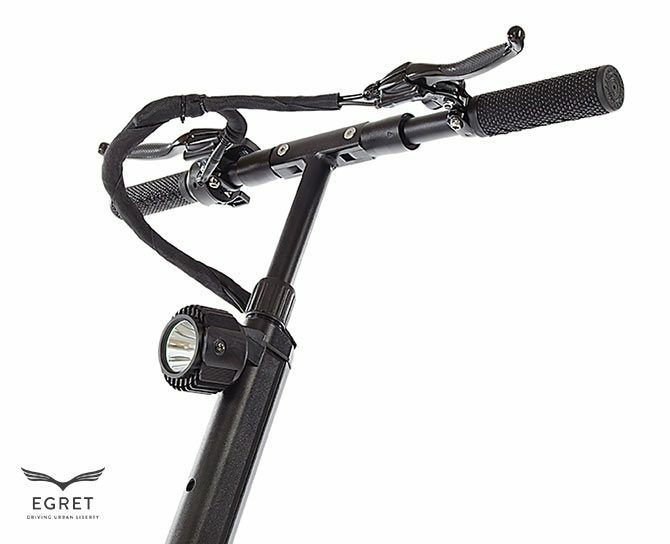 The One GT comes with rear and really bright front light plus it has a handy little kickstand. Both have lots of extra accessories to choose from. 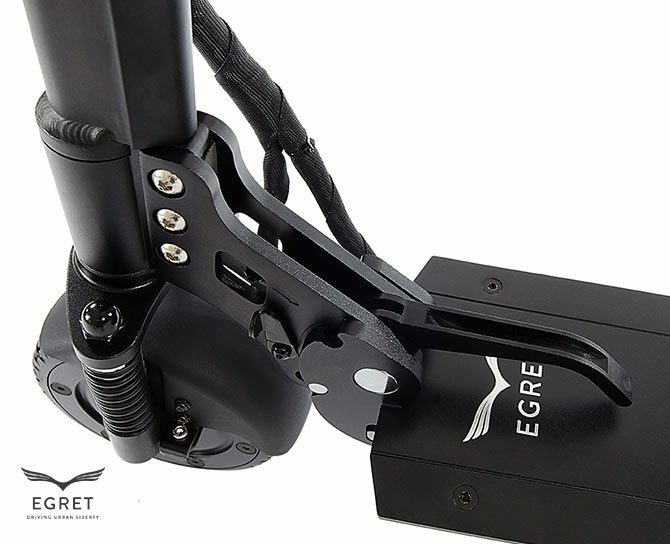 Egret offers a full 2-year warranty in all range. 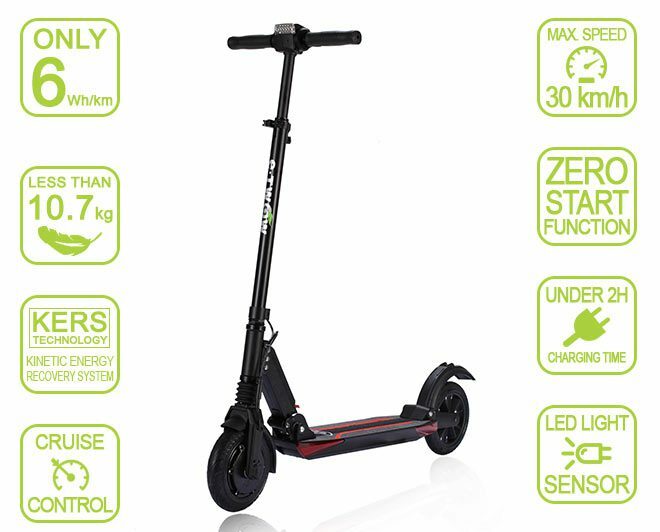 LIMITED TIME ONLY: £50 discount (plus FREE UK delivery) when buying an electric adult scooter in our store ! Simply enter the coupon code: S1C007er at checkout. Previous post: Citybug2 won the ISPO award 2016. Next post: Stigo, lightweight e-scooter that can be folded in 2 seconds. to use on the road in the UK? China? (i.e. lowered speed limit)? Hi Paul, sorry for my late reply, none of this vehicles are road legal in the UK. We recommend it use anywhere where road traffic rules and regulations do not apply. This may include: Private property, harbour areas, airport and exhibition grounds as well as parks and woodland areas, depending on the signs posted. Europe-wide on-road approval is expected within this year 2016. There is not difference on aesthetics or quality, yes on power and speed, for EU there are limited to 250 Watts of power and 15.5 miles/h on speed. Nice post as I was just trying to choose between both…now I’m not sure! Hi Tob, Roberto here from PET. 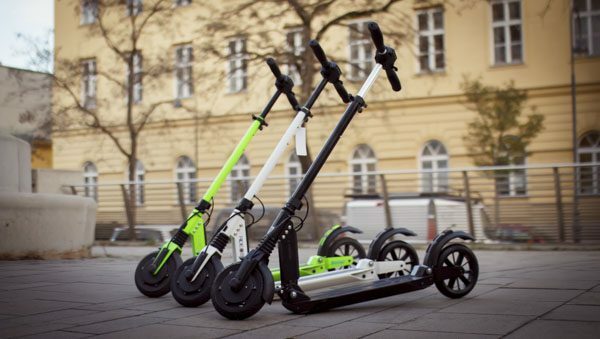 Both e-scooters are similar in terms of performance and range, is a question of analyzing your journey, the weight of the unit plays an important role on a mix commute when you have to carry the vehicle up and down but if your journey is door to door both are perfect. Don’t hesitate in contacting us if you request more information. Thanks! scooter for major european city.